“Everyone is responsible for themselves”, said State Secretary of Serbian Ministry of Culture and Information Aleksandar Gajović, commenting on the attack against N1 TV journalist Nikola Radišić, who was assaulted and insulted in the street. The attack followed a series of harsh criticisms directed against the editorial policy of this independent television broadcaster, which Serbian president Aleksandar Vučić refers to as “American”, while Interior Minister Nebojša Stefanović calls it CIA's TV station. In a recent interview with Radio Slobodna Evropa, Gajović said that the issue of attacks against journalists does not fall within the competence of the Ministry of Culture and Information, adding that “real journalists and real newsrooms need to listen to the other side as well”, and that he expects an explanation from the aggressors, whose identity is still unknown. “I would like to know their side of the story as well, did they really do it or not. Of course we are going to condemn every attack, but first I want to see what is behind these attacks, who is hiding behind them, if anyone is hiding”. 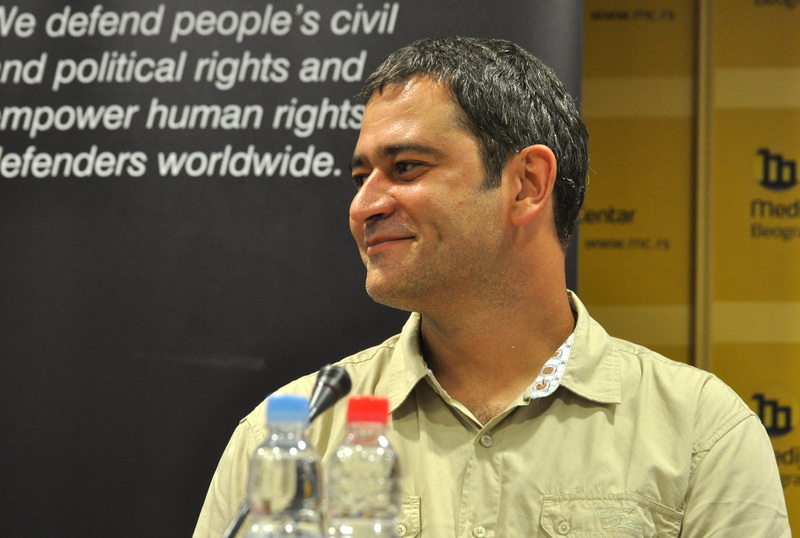 Later in the same interview, when asked about the death threats that appeared on social media against Nedim Sejdinović, president of the Independent Association of Journalists of Vojvodina (NDNV), Gajović responded with a counter-question: “Are you really sure it wasn’t him that organised it all, in order to present himself as a victim?”, concluding, “I think that man doesn’t have good intentions”. These statements provoked strong reactions from the main Serbian journalists’ organisations, which requested Gajović’s dismissal, but prime minister Ana Brnabić avoids taking position on the issue, simply ensuring that “attacks of any kind are unacceptable and will not be tolerated”. According to data from the Independent Association of Journalists of Serbia (NUNS), since the beginning of the year there have been 15 cases of attacks, serious threats, and pressure against journalists. The motivation behind these intimidatory acts is always the same: journalists’ critical stance towards the political establishment. Following the murder of Kosovo Serb politician Oliver Ivanović – that happened on January 16th in the northern part of Mitrovica and was preceded by a months-long demonisation by Serbian pro-government media, which labelled him as traitor – Beta News Agency editor-in-chief Dragan Janjić tweeted: “The elimination of political opponents has begun”. In a press conference later that day, president Vučić made explicit reference to Janjić and then said: “None of us are murderers, as some would wish”. Although Janjić didn’t accuse Serbian authorities of involvement in Ivanović’s death nor did he call anyone a murderer, after the above-mentioned press conference he became target of threats. One of the posts appeared on Facebook containing accusations against Janjić also contained his home address, while among hundreds of hostile comments there were some explicit exhortations to lynching, such as: “Take him to Kalemegdan and shoot him in the forehead” or “Hang him in the square”. On top of that, in the beginning of February prime minister Ana Brnabić targeted NUNS president Slaviša Lekić saying that “calling an elected head of state a murderer, like NUNS president did, is contrary to European values”, alluding to Lekić’s alleged position regarding Ivanović’s assassination. Reacting to this statement, Lekić announced that he will file a lawsuit against the prime minister, who “will have to appear before a judge because of such an offense and lie”. Tamara Skrozza, a journalist from weekly newspaper Vreme, has been vilified for days by pro-government TV channel Pink just because she participated, as a member of the board of directors of non-governmental organisation CRTA, in a press conference presenting the final report on the media monitoring conducted during the period preceding the official start of the Belgrade local elections campaign. The Serbian interior ministry has recently rejected a request by Philippe Bertinchamps, a Belgrade-based Belgian correspondent for Le Courrier des Balkans and other French-language media, for a temporary residence permit so that he can continue living with his Serbian family. Instead, he is now threatened with expulsion for posing an “obstacle to public order and national security”. Here the press release . Although more than 300 journalists and citizens submitted a complaint to the Electronic Media Regulatory Authority (REM), denouncing the defamation campaign against Skrozza, this institution has not yet determined whether TV Pink violated professional standards, nor has it undertaken any measure envisaged by legislation in cases like this. The campaign against Skrozza started after president Vučić, appearing on a television programme, associated NGO CRTA, involved in electoral observation activities, with a foreign embassy (without specifying which one), concluding: “The whole plan is to make SNS [Vučić’s party] lose”. It has become customary for pro-government media to follow up on such statements, often made by president Vučić and some other state functionaries, with defamation campaigns against independent media and journalists, labelling them as traitors and foreign mercenaries working against their own country. That is why few were surprised when, on the night of February 5th, the front door of NUNS’s offices was covered, for the second time in just a few days, with leaflets saying: “Miserable association of enemies of Serbia”. Given the overall atmosphere of hostility towards independent journalists, few believe that the Attorney's Office will bring to justice not only those responsible for this last incident, but also many others who, anonymously or publicly, threaten journalists on social media or in the street, as happened in the case of TV N1 journalist. The messages coming from the highest representatives of the state encourage intimidating behaviour towards journalists. Although Brussels has warned Serbia that the respect of media freedom is a prerequisite for further progress towards the EU, and although many international organisations, like Reporters Without Borders, continuously denounce pressures put on independent journalists and media in Serbia, Belgrade's political establishment denies any responsability for the present situation. A recently published study conducted by the Slavko Ćuruvija Foundation, titled "Control and freedom of the media: journalists' testimonies", shows that 74% of journalists in Serbia think that there are serious obstacles to the exercise of press freedom, or that there aren’t even the conditions for it, while nearly two thirds of the journalists interviewed believe that “the media are mainly controlled by the political establishment”. According to data from NUNS, in 2017 there were 92 cases of attacks, threats, and pressure against journalists and the media. The latter cannot even count on adequate legal protection, because the judiciary is getting less and less immune to the pressures exercised by the ruling party, guided by president Vučić. Judging by recurrence, number, and nature of the attacks against journalists reported in the first month and a half of 2018, as well as by rhetoric and actions of representatives of the political power, it seems that the state is not at all willing to make efforts to ensure the safety of journalists. The Serbian interior ministry has recently rejected a request by Philippe Bertinchamps, a Belgrade-based Belgian correspondent for Le Courrier des Balkans and other French-language media, for a temporary residence permit so that he can continue living with his Serbian family. Instead, he is now threatened with expulsion for posing an “obstacle to public order and national security”.Here the press release .